Stainless steel jewelry is an increasingly popular option in the jewelry world, particularly for men. Its strength, visual appeal and resistance to discoloration are all factors that influence a man�s decision to wear jewelry like Stainless Steel Pendants. These pieces of jewelry can become permanent fixtures in a man�s wardrobe if the right consideration is taken to choosing the gift for the recipient. In addition, pieces made of surgical steel can be worn by people prone to allergic reactions to jewelry. Read more. ApplesofGold.com offers a variety of Stainless Steel Pendants that are sure to appeal to any special person in your life. These pieces can tell a story or make a statement ideal for that gift recipient you have in mind. Simply look for the right piece today. Special occasions, holidays and milestones in a person�s life are all great times to give gifts like Stainless Steel Pendants. This shows the pride of the gift giver, as well as the fact they realize the recipient is proud of the event that is occurring. A pendant or other prominent piece of jewelry can become a talking point and source of pride for a significant amount of time to come. 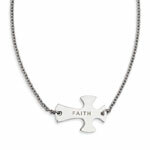 Pendants come in a religious theme, simple silver or silver accented with color or gems. Apples of Gold also carry pendants that have a tribal theme, a Celtic theme, engraving or have personalization available. This means a significant variety to the choices available to ensure the right gift is within your purchasing grasp. One important thing to remember when considering the purchase of Stainless Steel Pendants is that the metal will not discolor the skin of the wearer. It is also an appealing feature that the metal is strong and will not tarnish or rust. This means Stainless Steel Pendants are a great choice for someone who likes to wear silver jewelry but prefers to avoid effort in the care for the jewelry. Jewelry purchases are made for the significance to the recipient. With pendants and other larger pieces, it is wise to take that care to choose one that will be easily cared for and will suit the wearer to perfection. The line of jewelry available at ApplesofGold.com makes that choice that much easier. Start looking for that perfect gift today, so it can be in the mail and in the recipient�s hands that much faster. You won�t regret the decision, and neither will the person you shop for today.